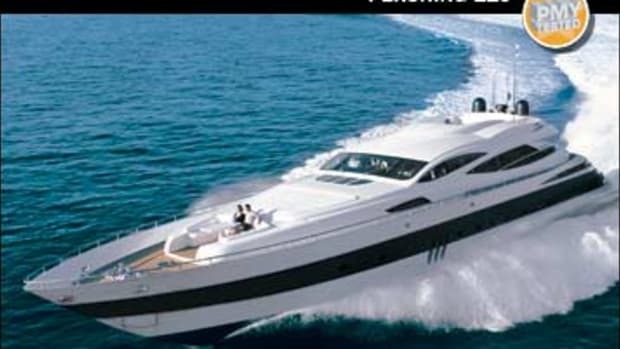 Pershing lives up to its name with a yacht that flies across the water with guided-missile speed. Pershings seem to defy the laws of physics. It is normal for one to assume that as things get bigger they also get slower, but no one seems to have told them that. Look back on the Pershings we have tested over the years, ranging from 62 to 115 feet, and there’s only five knots difference between them at WOT. And WOT for a Pershing has to mean 40 knots or better, even for the 112-ton flagship, because among the promises this brand makes—along with great engineering, drop-dead looks, and an eye-watering price tag—are razor-sharp handling and uncompromised performance. Laden as she was with seven tons of fuel and water, not to mention the five tons of optional gear installed to satisfy MCA certification, our 108 was very nearly the heaviest Pershing yet. 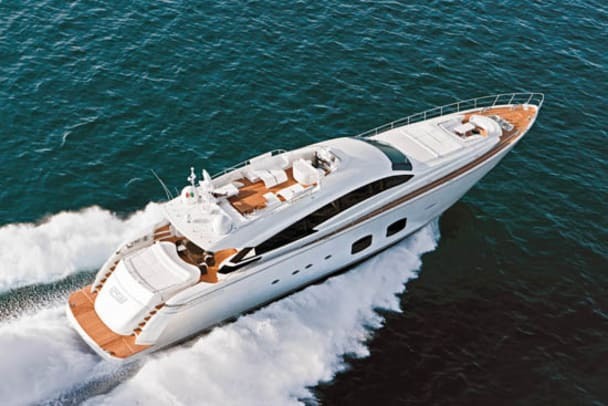 And in the choppy, early summer seas off the city of Fano on Italy’s Adriatic coast, she blasted through 40 knots in as many seconds. A two-way average of 43 knots, and Pershing’s head of engineering was happy. So was Bertram’s head of engineering, who had flown over from Florida to see how things were going with the sister company. 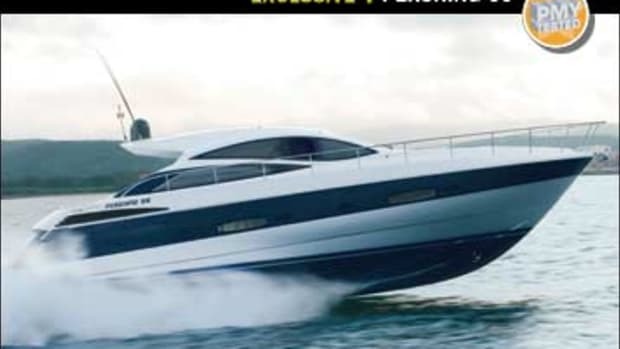 “Do they always handle like this?” he asked me, amazed at the way the big motoryacht leaned over on her ear with every appearance of enjoyment, to carve out wake-chasing turns, like some gargantuan skiboat. 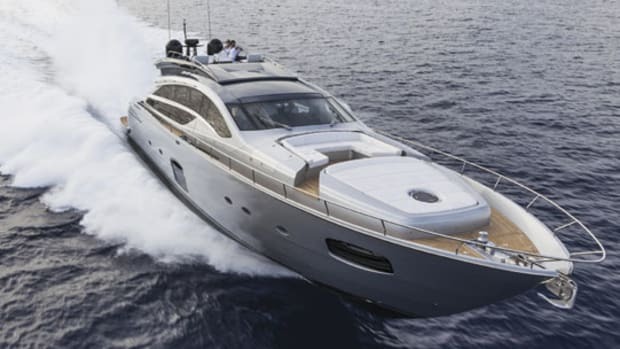 It was a typically exhilarating Pershing experience, and while it takes care and experience—not to mention practice—to trim a triple-Arneson rocketship packing this much horsepower, the end result is so well balanced that it enthralls rather than intimidates. It’s fun—you soon get the hang of it. 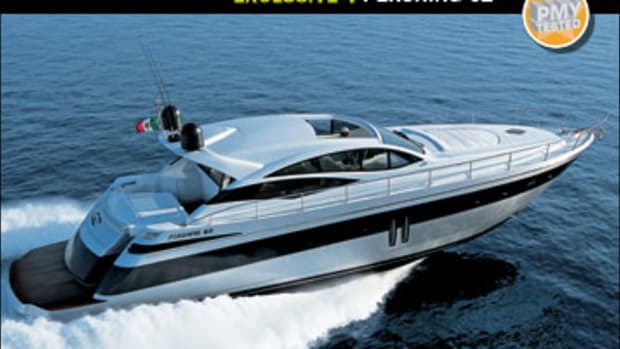 Our test boat was the prototype 108, an all-new design that fits into the range between the 92 and the flagship 115. 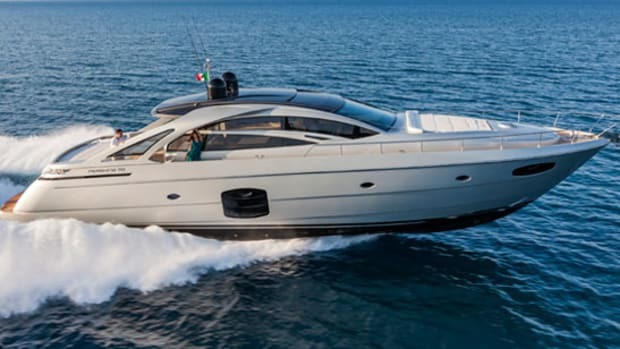 She is the fourth Pershing for her British owners, who took full advantage of the various customizing options the shipyard offers on yachts of this size. Most significantly, as a cruising family, they chose not to have the fourth cabin, which on the plans is a decent-looking twin berth en suite to starboard. Instead, this first 108 has an open-plan TV lounge that does away with the corridor and adds significantly to the feeling of space down below. Not that she seems small. Even in a yacht with an exterior like an overgrown dayboat, a 22-foot beam provides plenty of scope. As is only fair, the owner’s suite amidships gets the lion’s share of the available volume, spanning the full beam and featuring an attractive raised study area, a large head with twin basins, and a roomy shower stall, with the whole compartment finished in reflective black Corian and glass. It’s sleek and a serious test of the crew’s sense of humor—merely admire the shine with your fingertips and the surfaces need polishing. Again. The berths in the port-side guest cabin, each 33 inches wide, can slide together to form a full-size double berth. Forward, the slanted layout of the VIP suite looks unusual though in reality the angle of the berth follows the shape of the hull and is an efficient use of space. The cabin certainly feels roomy enough, and there is a huge volume of stowage space in the cabinets along the forward bulkhead. The VIP head, although nowhere near as big as the master’s, is well proportioned and of a good size. Thanks largely to the three-cabin layout, the living spaces below decks feel unusually roomy, even for a 100-plus-footer. And with its big, square-set seating area and aft dining table, the main deck feels even more so, and for a similar reason. While the lower deck benefits hugely from the “missing” fourth cabin, the saloon makes gains that are quite out of proportion to the simple sacrifice of situating the galley down and aft, in the crew area. Low cabinets and large areas of glass make the best of the main deck’s deceptively simple, rational layout. It’s big, and feels even bigger. Headroom is 7&apos;2". 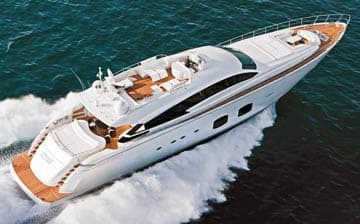 While the custom build of the lower-deck TV lounge is the most obvious manifestation of Pershing’s customization, the prototype 108’s owners also had plenty to say about the dcor, bringing in their own designer and a multitude of fabrics and furnishings from the likes of Fendi and Armani Casa. I must say the end result looks very pleasing. The sycamore veneers are standard, as is the Poltrona Frau leather; the Nepalese silk carpet in the master most certainly isn’t. The AMX entertainment system is also to the owners’ specification. 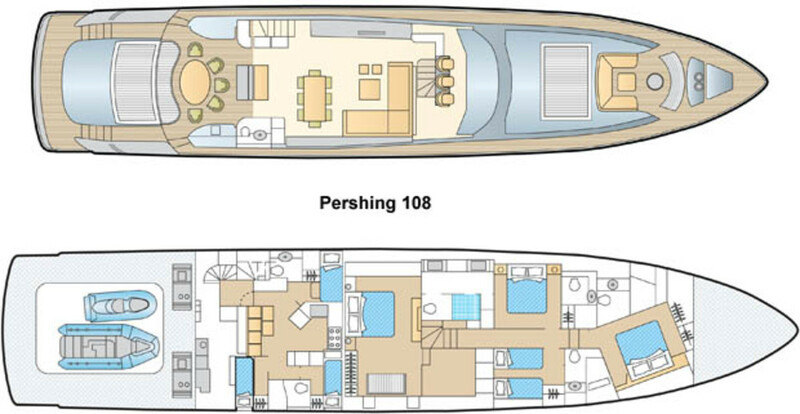 Even without such particular requirements, you could have fun with Pershing’s suggested-options list for the 108. Among those in evidence on the prototype are the forward davit to serve the vast foredeck, which on this boat contained two big Sea-Doos and MCA-spec safety equipment; a swim-platform stainless steel swimming shower, which plugs into hose connectors designed as if to refuel Formula One racing cars; and the upper helm station, which, having used it, I regard as essential, for both ease of close-quarters maneuvering and the sheer, exhilarating fun of driving from the roof. 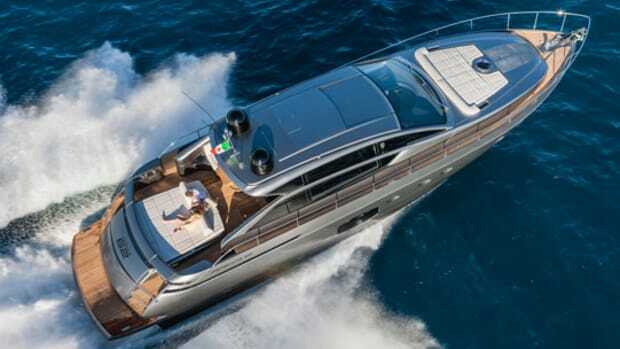 The tender launching system is also a model of elegant simplicity: The aft platform lowers to create a slipway, while rollers and an electric winch do the rest. Check out the fuel pump in the garage—a personal filling station for the diesel tender, drawing from the main tanks. Ah yes, diesel. There’s no escaping that this boat uses a lot of it. 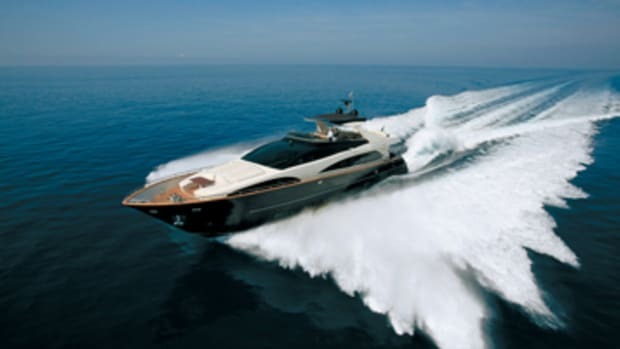 Arithmetic soon reveals that at full chat, the Pershing 108 is drinking nearly seven gallons a minute. That she does so for nearly 300 nautical miles is testament to her well-shaped hull, efficient drivetrain, and monumental 3,170-gallon fuel capacity. 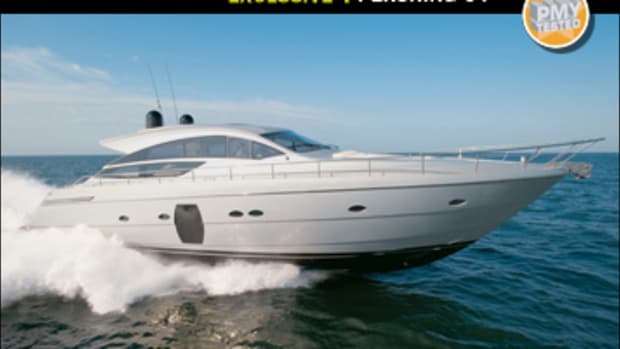 The triple 2000 M94s are elegantly installed in a surprisingly spacious engine room, the outer two engines set high and forward, the center engine low in the vee. All drive straight aft through three huge Arnesons and six-blade props that lurk just beneath the surface. What a trio. And what a performance.